The 117th Soundtrack of the Week is Toru Takemitsu's music for Kawaita hana (Pale Flower). Takemitsu is one of my favorite composers and way overdue for a Soundtrack of the Week. Takemitsu's name is the second from the bottom. The last name is Yuji Takahashi, a pianist and composer who apparently collaborated with Takemitsu on the score. 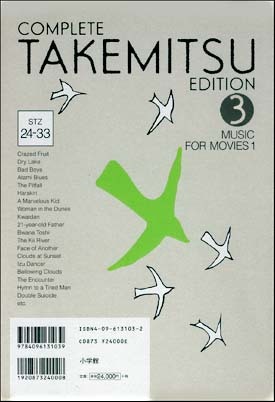 The music for Pale Flower is included in the third of five box sets that make up the Complete Takemitsu Edition, presumably everything Takemitsu ever did. The CDs are accompanied by beautiful hardcover books that I should really try to translate into English someday. Part of the reason it's taken so long to have a Takemitsu score here is that I have to dig the music out of this box. Takemitsu never over-composed for any film, as far as I know, and there are only 14 minutes of music for Pale Flower. The first cue is for deranged, rattling percussion—tap dancing, Latin percussion, castanets, etc.—with wailing horn blasts that slide down in pitch, suggesting the Doppler effect. The second cue has more of the same unsettling percussion with long tones from wind instruments. The third cue, a little over a minute long, has sparse percussion with sharp horn attacks. Eventually several horns play at once in a dizzy, free jazz orchestra sort of way. The fourth cue is only 26 seconds long and features contrabass and more dissonant horn ensemble playing. The fifth cue is only 15 seconds but has a cool bit of avantgarde steel guitar, courtesy of Backy Shirakata. Track six is a bonafide song, done in lounge piano trio style. It's a bit similar to "Begin the Beguine" and "Laura", I guess. Track seven is more jazz piano trio but in an upbeat, postbop idiom. Great playing. The eighth cue is about a minute long, and consists of wordless vocals by solo male voice. There's a lot of reverb, probably from whatever room it's recorded in, and is pretty interesting. The liner notes suggest that the voice belongs to Takashi Fujiki, who might remind you a bit of Makigami Koichi here. Track nine brings back the percussion, horns and steel guitar for a cue that begins sparsely but builds in density and intensity. It's similar to the other cues with the same instrumentation. Track ten is only 17 seconds long and begins with a Doppler effect horn blast. Atmospheric percussion and a drone finish the cue. The eleventh and final track begins the same way as track ten but features the contrabass, soloing in something of a free jazz style before the horns come in again. Pale Flower is a really interesting movie, part of the Japanese New Wave in the 1960s. It's sort of a nihilistic gangster movie, directed by Masahiro Shinoda. The black-and-white, widescreen photography is beautiful. In addition to Takemitsu's score, a Muzak version of "Now or Never" is heard in the film. The same song was used as a recurring theme by Masaru Sato in his wonderful score for Kihachi Okamoto's brilliant and bizarre Satsujin kyo jidai (Age of Assassins).